December 28, 2018 - A special message to site-visitors from Dongguan, China: We are glad you have found this site. It is important that families of QSI-DG know the history of Dr. Stephen Jackson. If a boy has been harmed it is imperative that he receive thorough and appropriate counseling immediately. It is proven that early counseling can save a boy’s life, and help that boy avoid depression, PTSD, and substance abuse in later life. In November, 2018 we contacted Director Haberman, and Regional Director Eben Plese and asked them to tell you Dr. Jackson’s history so that you could respond appropriately with your children. We hope they have done so. See emails below. 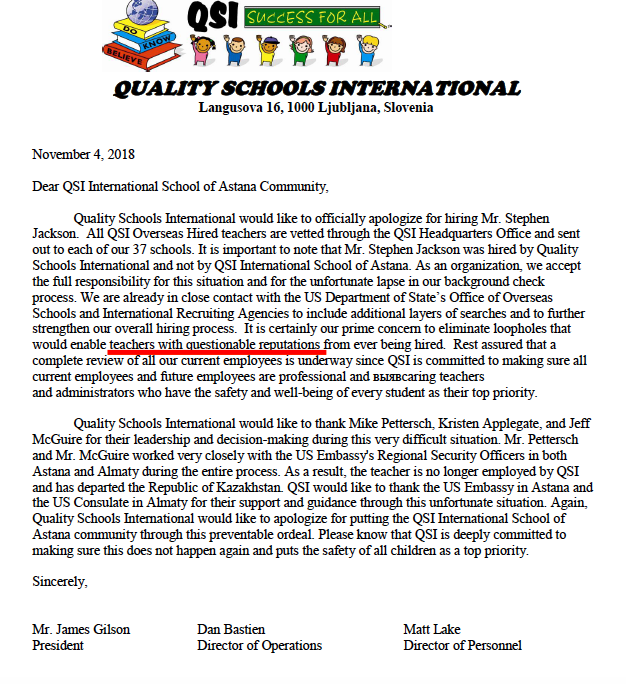 PLEASE NOTE AT BOTTOM OF PAGE : THE LETTER WHICH QSI SENT TO THE ASTANA, KAZAKHSTAN SCHOOL COMMUNITY WHICH FAILS TO DISCLOSE JACKSON’S HISTORY OF CRIMES AGAINST CHILDREN. INSTEAD, THEY INDICATE HE HAS A “QUESTIONABLE REPUTATION”. ﻿I've been informed that you are aware of the history of Dr. Stephen Jackson who was teaching at your school from January to June of this year. I represent a group of his victims, as well as former colleagues of his, who are committed to trying our best to stop further abuse. We are aware of reports of abuse dating back to 1968. Our biggest concern for your school is that the parents have been notified. If a child has been sexually assaulted by Dr. Jackson, it is imperative that the child receive appropriate counseling as soon as possible. It can mean the difference between a healthy and miserable future life. Many of our victims, now in their 50's didn't tell anyone until 10 years ago, or so, and have suffered depression, PTSD, explosive anger disorder, etc. ﻿Could you please assure us that you have informed the parents of Dr. Jackson's students? Thank you for writing and for your concern. All questions about Dr. Jackson are being handled by QSI personnel office. Please be assured that we have counselors in place to support students as needed. Lisa Haberman forwarded me your recent messages asking about our steps regarding Mr. Jackson. I have been asked by QSI personnel to respond to your questions. At this point, our school in Dongguan has released the same information that was released to the community in Astana [see letter below]. As Ms. Haberman shared with you, we have counselors available to any students who may be in need of support. All of our schools have worked closely with each other in responding appropriately to this situation. Additionally, all of our schools have developed child protection policies that are publicly available. I hope that this addresses your concerns. I saw the letter you sent to parents at Astana, and since it did not include explicit information about Jackson's history (which would have motivated parents to talk to their kids about any possible incidents), I gather the parents at Dongguan were also not informed. (In your email you wrote that the parents in Dongguan received the same information as the parents in Astana.) Whereas some parents might have been able to search the internet and find news articles or our website, I imagine most did not, given various limitations on internet searches, especially in China. I understand, but fervently disagree with, your decision to not give parents all the information they need. I've studied 50 years of Jackson's sexual abuse of children, and have added a time-line below, so you can see the path of destruction he's left in his wake. Besides being a sociopathic serial child molester, Jackson happens to be an excellent educator and is able to gain friendship with, and respect from, colleagues and administrators in a very short period of time. He also is able to become a "favorite" teacher with students very quickly, which he did at Astana and Dongguan. This is how he builds the scene, this is how he sets the stage. And this is why schools let him go, and play it out as quietly and quickly as possible, notifying as few people as necessary. No one can believe it, and no one wants to admit that they were duped, too. Add in every school's need to maintain a solid reputation, and it plays out in Jackson's favor, every single time. By not giving parents all the information they need to care for their children, I believe you are doing a great disservice to the families you serve. The following letter was released to parents in Astana, Kazakhstan. Please note, although QSI apologizes for hiring Mr. Stephen Jackson, they do not reveal the whole story, the dozens of reports of child sexual abuse, the many police reports, the news articles, nor the denial of teaching licenses in both California and Colorado. They only say he has a “questionable reputation”.